The Woodlands Resort has more than 60,000 square feet of dedicated meeting space across 33 meeting rooms, including a 13,430-square-foot Grand Ballroom. Design and interiors that feature contemporary Texas architecture with strong elements of stone, steel, and wood, so even when you’re inside you feel connected to the lush outdoors. A relaxing and fresh environment for productive meetings. Prefer to be outside? Our 28,000 acres of natural forest means we also have unmatched outdoor venues for a variety of events. Nestled in the picturesque Texas Piney Woods, you’ll find deluxe accommodations, exciting amenities, championship golf courses, world-class tennis center, multiple pool areas, spa and fitness center, a vast network of trails, and the Forest Oasis: Lazy River & Waterpark. The Woodlands Resort and Conference Center is an exceptional venue located 18 miles from the George Bush Intercontinental Airport and only 27 miles from downtown Houston. The Woodlands has variety of indoor and outdoor meeting venues ranging in size from intimate to grand. That’s more than 60,000 square feet of event space across 33 flexible rooms, many with views of glistening lakes, lush fairways and woodlands. Contact information, number of rooms, meeting facilities and services, amenities, dining, and nearby attractions, all in one handy reference. 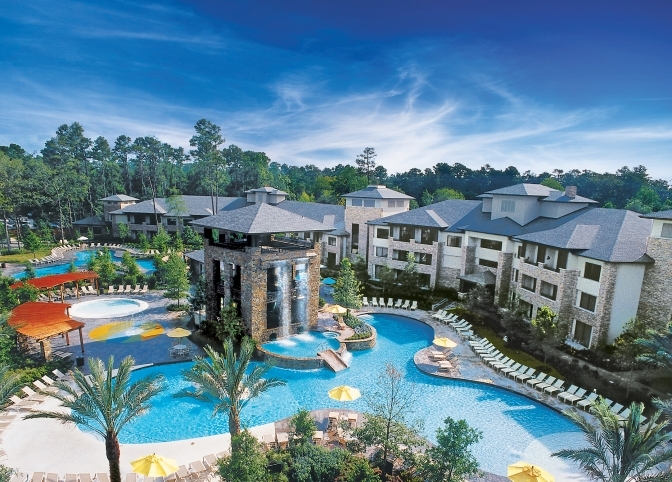 The Woodlands is three guest room buildings, 60,000 square feet of meeting space, 36 holes of golf, four dining outlets, and an incredible waterscape tucked away within the Texas Piney Woods on 28,000 acres of natural forest. Submit your request for proposal and our team will be in touch to help begin planning your upcoming meeting or event.